Creating responsive websites have always remained a challenge for many even I faced similar difficulties in the beginning. Recently, our team came across a situation where we had to design a responsive and beautiful website in Drupal 8 for a media and publishing firm. In order to create such an amazing site, we came up with an idea to use Foundation Framework and yes! it worked. Foundation has been designed for and tested on various browsers and gadgets. The open source framework is a mobile-first that give developers best practices for rapid development. Other features of Foundation - it is consist of 12 column grid system, supports stylized CSS components and RTL (right to left) direction format and compatible with several browsers. Foundation has three core Breakpoints. Small Any Screen up to 639 px. Medium Any Screen from 640 px or Wider. Large Any Screen from 1024 px or Wider. In addition to Android browsers, Foundation also supports all the latest versions of Chrome, Firefox, Safari, Opera and Internet Explorer. Well, there are many differences and similarities between Bootstrap and Foundation. The main similarity is that they are both great front-end frameworks that can be used to build an awesome application and website. Note: Bootstrap supports both LESS AND SASS (SCSS) Preprocessors, but Foundation supports only SASS (SCSS). Here * represents a number, valid up to 12. Well, there are many ways to install Foundation, but here I will be discussing two ways: First by CSS and second by using the terminal. 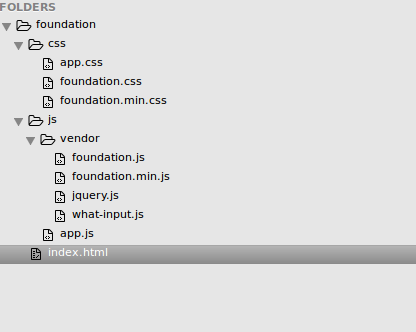 If you are just getting started with CSS then you can download Foundation. Customize it and choose the features you want to have on your website. While getting started, you can find a couple of options like Downloading complete Foundation and Download customized Foundation. Select as per your requirement. After downloading Foundation, your folder structure would look like this. See the screenshot below. jquery.js is required to provide the Responsive functionality to the website. You just need to have JQuery version 1.10 or higher on your page before the foundation.js library. what-input.js is used to track the current input method. foundation.js is used for utilizing core functionality. app.js is the custom js file which we can add our js. You need to specify all the above files in your HTML file. 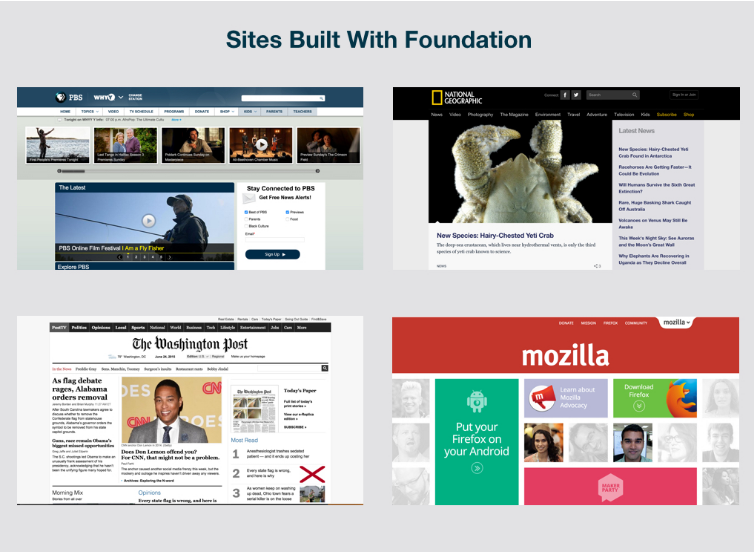 See the screenshot below for an example of Websites designed with Foundation Framework. Using Foundation Framework, we can build responsive websites that will be both unique and beautiful. In this blog, we have explored the basics of Foundation Framework, its overview, features, companies using this framework to design responsive sites as well as how to install customized Foundation using terminal and CSS. This blog is intended to give you a brief intro of the framework and its comparison with Bootstrap. Foundation Framework helps in reducing the CSS and JS, so we recommend you to try multiple front-end frameworks to find out what works better for your current project. Based on your comments and suggestions, I plan to add to it, creating additional value. Or maybe it is perfect as-is! Had started my career with UI Development and now enjoying the world of Drupal Theming!